Shoyeido's bowl incense holders are used with white ash, reflecting Japan's long ceremonial incense tradition. Each hand-thrown and glazed bowl features a three-footed base to provide stability and consistent heat transfer when used with white ash and charcoal. 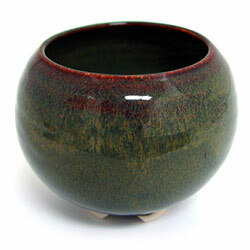 Shoyeido's skilled potters' freehand glazing process produces unique and beautiful finished works of art.